Would you like to have every outgoing Lotus Notes messages signed automatically. Actually, it could be done. From the menu, choose Actions > Tools > Preferences. Enter the signature text in the text area. 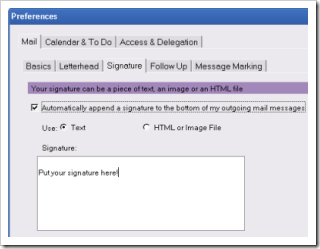 Select "Automatically append a signature to the bottom of my outgoing mail messages." to always display signature to all outgoing messages. Note: To remove the signature, uncheck the check box in step 4.